Thread either end of the mineral electrode clockwise onto the silver metal screw stud at the centre of the unit, which is also at the centre of the spring electrode. Lay end-cap/spacer onto end of mineral electrode and inside of spring. Place screen cage over electrodes and line up centred holes with the threaded bore in the mineral electrode end. 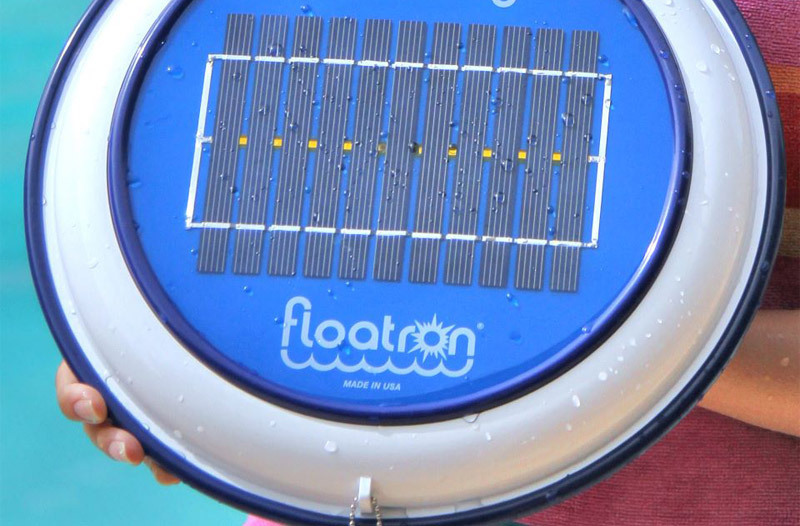 The floatron will protect your pool against microorganism invasion. Its solar ionisation process transforms your water into biologically healthy and algae resistant mineral water. Depending on the volume of water, weather conditions, and usage, the initialisation period will range from about a week to several weeks. The floatron cannot ionise a pool instantly, because it is designed as a trickle charger with a safe and effective low power output. Therefore, it is important to maintain a normal sanitiser level during this initialisation period until the ion concentration reaches a protective level. Begin with normally chlorinated water, and normal pH for your pool. Use your regular chlorine test-kit to maintain approximately 1.0 ppm (Parts Per Million) chlorine residual. More chlorine may be necessary if conditions warrant. Clear the water prior to floating your floatron. If your water is less than clear, it may require a 'shock' dose of oxidiser/chlorine. Check for presence of copper ions in the water with the ion test kit. See 'Ion Testing'. The typical reading at this point is zero to trace amount (0.0 - 0.1 ppm). If higher concentrations are detected, this is usually caused by the previous addition of a copper based algaecide. If this is the case, manage as outlined under 'Ion Testing' chapter. The mineral electrode is made of a unique alloy of several specific metals, predominantly copper. The ion test kit detects the presence of the copper ion, thereby enabling you to determine if the water has an adequate level of protective minerals. The reagents in the kit are very sensitive, and readings can be affected by various interferences. Accordingly, use the ion test as a basic and general indicator. Test only once a week; more-often is unnecessary. The purpose of ion testing is to determine initially that it is safe to reduce chlorine. Subsequently, it is to establish a floating schedule which results in a steady ion reading of approximately 0.3 ppm. Depending on conditions, pools with 75,700 litres or more usually require full time floating. Smaller pools will usually maintain an adequate ion level with a part time floating schedule. For example, one-day-in, one-day-out, two-days-in, one-day-out, one-week-in, one-week-out, etc. Pools with screened enclosures will probably require full time floating as the output will be about half of that with normal full sun. During this period you should observe the ion level build up to approximately 0.3 ppm. Float the unit daily and do not reduce the floating schedule unless the ion level tends to climb too high. Remember, more ions are not better. The water has a capacity to hold only a certain amount of minerals, and attempting to exceed what is known as 'saturation point' may result in minerals collecting on pool surfaces. It is important to spend a few minutes a week to check the ion level and to keep the electrodes clean (see 'Electrode Cleaning'). Upon reaching the recommended ion level of 0.3 PPM, initiate chlorine reduction by allowing the chlorine concentration to drop to about half of its normal level, or approximately 0.5 ppm. The pH range may now be expanded from 7.2 - 7.8. The floatron works well at higher pH values, so do not arbitrarily attempt to adjust the pH if it is within this recommended range. Keep in mind that the general idea is to use your floatron just enough to maintain an adequate ion level, and to determine how little chlorine is necessary to keep the water clear. Allow the water to settle down and seek its own balanced condition. In addition to generating beneficial mineral ions, the floatron is the only purifier that collects undesirable minerals such as calcium and iron. This has the effect of softening your water. The sacrificial mineral electrode is designed to slowly erode away and, in the process, will form a scale buildup which will require occasional cleaning. The spring electrode may also form a scale, which normally consists of calcium, and should also be cleaned. The initial rate of buildup will be quicker in harder water, and will slow as the water becomes progressively softened. Remove thumbscrew, screen, and end-cap. The electrode does not need to be cleaned down to bare metal; although, the spring is relatively easy to clean completely. If the majority of the scale is removed, the floatron will perform satisfactorily. It is not possible to clean the electrodes too much or too often. The cleaner the electrodes, the more efficient the operation. Occasionally, the screen mesh will require cleaning to ensure a free flow of water and ion exchange. Because the mesh is very fine, deposits can slowly block the openings in the screen and restrict water flow. Mix about 1/3 muriatic/hydrochloric acid to 2/3 water and place screen into a jar containing this mixture. The cleaning process will take a minute or less. Do not expose screen to the acid mix for more than a minute-or-so, as it could soften the plastic. Place the unit on top of the jar with the electrodes immersed. Remove when the bubbling action ceases. Do not leave electrodes submerged for more than a few minutes. It is important to spend a few minutes a week to monitor the water balance, clean the unit, and to learn the trends. After a couple of months of experience, you should have a good idea about how little chlorine or oxidiser is required, how much floating time does the job, the best way to clean the electrodes and how often they need cleaning. The floatron works well with trace chlorine or any other oxidiser of your choice. Algaecides, conditioners, clarifies etc. are unnecessary. Higher chlorine levels may be required with an increase in water temperature, increased swimmer load, rainfall or with new water added. If using liquid chlorine, add at or after sundown because the Sun's rays quickly neutralise chlorine. The recommended levels are not absolute and may vary with changing water conditions. What works best for your pool will be determined by experience. Allow your water to seek its own balance. Do not arbitrarily alter the pH, apply large doses of chlorine (AKA 'Shock'), add algaecide, add conditioner or try to change perfectly-clear water. Give your pool water time to stabilise, and remember...SIMPLICITY IS THE KEY! Remove screen and end cap, and clean parts. While compressing spring electrode with one hand, rotate centere electrode counterclockwise. If necessary, use pliers for leverage. Ensure ion reading 0.3 to 0.5 ppm. The mineralised water will protect against algae; the ions act as an algaecide, therefore, there is no need to add additional algaecide. If the water is clear, no need to oxidise. If less than clear, add chlorine/oxidiser. Top off water level, backwash and vacuum as necessary. Test ion level. Float unit to re-establish 0.3 ppm. If ion level is below 0.3 ppm, temporarily increase chlorine for protection. Maintain enough oxidiser to ensure water clarity. Fill a clear glass or plastic, litre-sized jar or equivalent with pool or tap water. With a full sun shining on the solar panel, very fine bubbles will be observed after a few seconds originating from the spring coils. This demonstrates that electrical current is being generated. Absence of bubbles indicates a problem. Allow new plaster type finishes to cure for a month, prior to using the floatron. Baking soda works well to raise pH, is readily available and reasonably priced. Household bleach works excellently for small and medium sized pools. For large pools, too many litres may be required, making more-concentrated forms of chlorine more convenient. Keep a tablet of chlorine in the skimmer, or floating dispenser, to provide a constant input of oxidiser into the pool. When necessary, add an additional boost of liquid or granulated chlorine to maintain clear water. Check water hardness, measured as total dissolved solids (TDS) at your local pool store. Readings of approximately 2,000 ppm or greater indicate the need to drain and refill with fresh water. If that is not possible, partial draining and refilling is beneficial. With a high TDS, the water cannot absorb and retain minerals very easily. The floatron works well with a pool cover. The choices are to open the cover enough to float the unit or cut a 3 inch "X" into the cover, which allows the electrodes to remain in the water while the top is exposed to the sun. Clear, high-quality water without algae and an abnormally-low ion reading does not necessarily indicate that your floatron is not functioning properly. In this situation, call your dealer. In hard water conditions, over time, the solar panel may form calcium deposits which are left by water evaporation. To quickly and easily remove the scale, apply diluted acid/water (as described under 'Electrode Cleaning') with a toothbrush. Allow to dissolve deposits and rinse. Vinegar may be used; although, more time will be required to do the job. Do not automatically take advice for granted from those who are not experienced with the floatron. This type of "expert" opinion is often influenced by the desire to sell or use chlorine and related pool chemicals. Additionally, recommendations more-often-than-not reflect a chlorine-based pool chemistry and are not applicable to ionised water. Do not add any clarifiers or metal removers that will eliminate the beneficial mineral ions generated by your floatron. Addition of algaecide is unnecessary, as the floatron is an algaecide generator. 'Shocking' ionised mineral water is poor technique. It's like an atomic bomb to the water. The water should be finessed. Oxidiser should be added at reduced dosages to clarify cloudy water.